An out of work party girl returns home and slowly begins to realise that she is heavily connected to a recent series of monster attacks in Seoul in Nacho Vigalondo’s Colossal. This is a film that can be read on more than one level. The basic concept of a woman discovering that she can remote control a monster is a fun little science fiction story that wouldn’t be out of place as an episode of The Twilight Zone. On another level it’s a character study about misfortune leading to self destructive behaviour and making bad decisions. Gloria (Anne Hathaway) is a mess of a human being after losing her job. Her boyfriend Tim (Dan Stevens) sends her away because he’s tired of her constant partying so she moves back home to where she grew up. It feels like the only place she can go to that will allow her to take a step back and process her live before trying to move forward. I found Gloria to be an interesting character because she’s damaged in an unconventional way. A lot of the film is spent showing how constantly self destructive she is with no apparent desire to improve herself. As such her arc doesn’t begin until quite late in the film but that makes it feel a little more real. She’s definitely a victim of circumstance but also seems content to just drown in her own self loathing. Anne Hathaway’s likeable performance is the key here. She manages to make Gloria likeable and I was rooting for her to get her life back on track throughout, a lesser performance could have turned her into a contemptible character but Anne Hathaway manages to make her a character worth investing in.. The other characters enable her rather than help her. Gloria spends most of her time drinking through the night with Oscar (Jason Sudeikis), Joel (Austin Stowell) and Garth (Tim Blake Nelson). These scenes are interesting because the actors have such good chemistry. Joel and Garth pretty much disappear as the film progresses and receive the least development. It does appear that there could have been a solid arc for Garth but the possibility is mentioned then quickly dismissed. Life becomes really strange for Gloria when she discovers that she is in control of a large monster in Seoul, South Korea when she enters a certain part of the town. It’s a compelling idea and the film makes good use of it. The visual effects on the monster are really impressive and the film shows enough of it to allow the viewer to use their imagination when the monster isn’t on screen. The monster plot isn’t the main one. Gloria is the focus of the film and the accidental damage caused by the monster is a metaphor for self-destructive behaviour affecting others. It’s a fairly obvious piece of symbolism and the film milks it a little too much but it’s really effective and delivers a clever spin on the monster movie in the process. 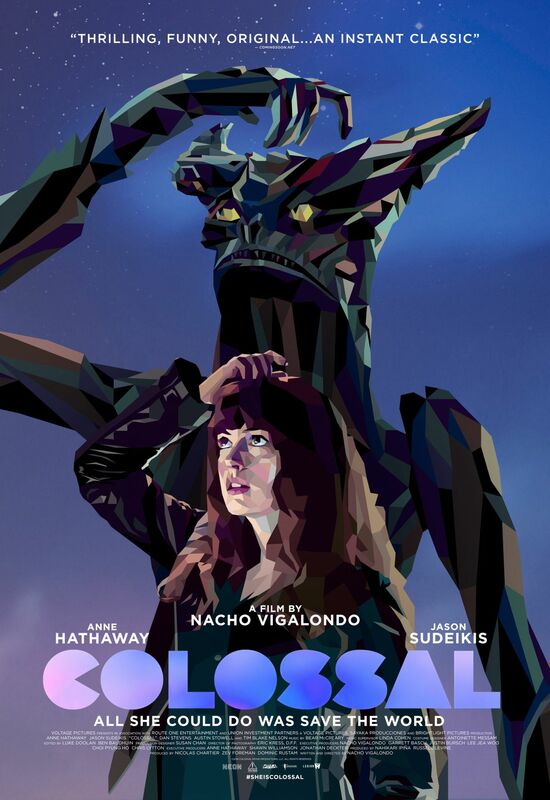 Colossal wears its themes on its sleeve which ultimately proves to be a good thing. Gloria’s excessive drinking and erratic behaviour starts her life down the path to ruin and the film also explores the concept of abusive relationships. This is embodied by Oscar (Jason Sudeikis), an old friend of Gloria’s who becomes very possessive and unkind when he’s drink. He is tied into the monster plot as well and ends up personifying Gloria’s conflict for the film. Essentially he becomes the physical representation of everything she needs to defeat to get her life back on track. It’s simple, clearly developed and really effective. Jason Sudeikis is great. He delivers a menacing and intimidating presence that is the right amount of unhinged. He’s two dimensional in the sense that he has no redeeming features but his character doesn’t need to be any more than that for the purposes of this story. Any scene he’s in is captivating to watch and the back and forth he shares with Anne Hathaway throughout is excellent. Another thing that bears mentioning without spoiling it too much is the ending. I won’t say what happens but it delivers something that plays with the bizarre premise in a way that both makes sense within the film’s internal logic and ends up being really clever in its own right. A fascinating character study that delivers a new spin on the monster movie genre. At its core this film is a character piece and the monster story serves as a metaphor about how self-destructive behaviour disrupts the world around you. It’s an obvious piece of symbolism but an effective one. Anne Hathaway is great in the lead role and the other actors do a good job of making the dialogue feel natural even if many of the characters fade into the background. Jason Sudeikis delivers an excellent performance as the antagonist of the piece and counters Hathaway wonderfully. The monster action is capably delivered with some impressive CGI used carefully and potently. It also culminates in an ending that both makes sense within the film’s internal logic and is clever in its own right.